The Guardian have yet again given headline billing to some bitter divisive anti-Corbyn whinging from another Labour Party right-winger. This time it's Peter Mandleson who is spouting off, and it contains some of the stupidest and least self-aware criticisms of Jeremy Corbyn yet. 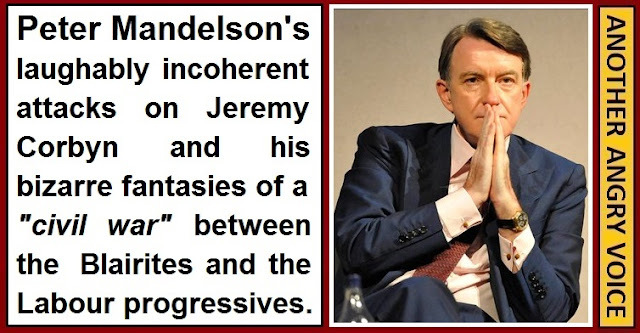 Several Labour party right-wingers and Tony Blair loyalists have been guilty of fantasising about overthrowing Jeremy Corbyn in the past, but few have been as brazen about it as Peter Mandelson. In the Guardian article on the 31st of December 2015 Mandelson called for Jeremy Corbyn to be overthrown sooner rather than later because he's terrified that Corbyn is strengthening his grip on the party leadership. He was also quoted using the phrase "civil war", as if the democratically elected leader of the party would somehow be the guilty party if a bunch of Labour Party right-wingers were to cause a civil war within the party by attempting to depose him! Hundreds of thousands of new members: The horror, the horror! One minute Mandelson is complaining about new Labour Party members because they are "massively outnumbering longstanding members in very many constituencies" (the horror! ), then he's complaining that Corbyn is working to co-operate with the Trade Unions and other left-wing groups outside the Labour Party, then he tops it all off by complaining that Jeremy Corbyn "doesn't understand or respect that Labour is a broad church". Mandelson's haphazard "argument" would be funny if it weren't so tragic. Whether you like Jeremy Corbyn or not, it's impossible to deny that he has been responsible for the huge growth in Labour Party membership, especially the inflow of younger people into the party. The Labour Party now has more members than it has had in decades, and these new members come from an incredibly broad range of ages and backgrounds. Corbyn's efforts to rebuild bridges that were burned down during the Blair era (with the firefighters union for example) and his willingness to work with outside organisations and other political parties to oppose the Tories suggest he's actually very keen indeed to run a "broad church". Apparently Mandelson's idea of a "broad church" is one that sticks rigidly to Blairite dogma, drives all the undesirable new members away from the party in droves and refuses to co-ordinate their fight against the Tories with the trade unions, different left-wing organisations and other opposition parties! It seems that Blairites are just as willing to use Orwellian language to sell their snake oil as the Tories are. Mandelson's rant is full of crap arguments, smears and delusional assertions, but one of the most pathetic aspects of all is the fact that he clearly believes in a fantasy universe where the general public would flock to support a Blairite coup d'etat against Jeremy Corbyn. The general public have twice rejected Blairism at the polls. The first defeat was bad enough because it allowed a bunch of ideologically driven incompetents into power, the second was far worse because it allowed the ideologically driven incompetents to stay there, despite their appalling track record of lies, incompetence, outright malice, rising debt, rising inequality, broken promises, social and economic devastation and catastrophically botched economic projections. Mandelson refuses to accept the reality that Blairism is finished. The ruination of the Labour Party in Scotland for the crime of being too close to the Tories isn't enough to convince him. The annihilation of pseudo-socialist parties elsewhere in Europe (like PASOK in Greece and PSOE in Spain) isn't enough to convince him. The huge surge of interest in Labour Party politics when the Blairite grip on power within the Labour Party was broken isn't enough to convince him. Mandelson and his ilk will never be convinced that it's time to move on from Blairism because they're suffering from a quasi-religious conviction that it would be better to tear the Labour Party apart with "civil war" between the Blairites and the progressives than it would be for the Blairites to accept that it's time to move on. The idea that whoever leads the Blairite insurgency will be heaped with praise by the Tory press and crowned with garlands by the general public is staggeringly delusional. Yes, perhaps Jeremy Corbyn isn't the most popular man in the universe, but absolutely nobody likes a backstabber. Mandelson repeatedly claims that Jeremy Corbyn and his supporters are hard-left. Anyone with the faintest understanding of politics knows that Corbyn is actually a centre-left social democrat, and it's just that the political spectrum has been shifted so far to the hard-right over the last four decades of unbroken right-wing rule that Corbyn appears to be very left-wing in comparison to the likes of the Tories, UKIP, the Orange Book dominated Liberal-Democrats and the Blairites within his own party. Endlessly repeating the argument that Corbyn is unelectable because he is too left-wing is blatantly fighting the Tory propaganda war for them. "Corbyn is too left-wing to be electable" is precisely the same argument that the Tories and the right-wing press use to attack him. In my view anyone who uses this pathetic line of attack is so closely allied with the interests of the Tories and the right-wing press that they clearly don't actually belong in the Labour Party. Another absurd assertion from Mandelson is that Corbyn is intent on telling people how to think. The fact that he allowed a free vote on the Syria bombing campaign suggests otherwise, as does his insistence that Labour Party policy should come from the grass roots upwards, not from the party leadership downwards. Mandelson is terrified of Corbyn's efforts to democratise the Labour Party so that members have more say over the direction of the party (instead of maintaining the centralisation of power with the party leadership, unelected advisers, think tanks, guided focus groups etc). However Mandelson is so intellectually dishonest that he's trying dress up Corbyn's efforts to democratise the party and listen to party members as an effort to centralise power and ignore people's views! It also shows a severe lack of self-awareness for Mandelson to lecture the public on who is electable or not, then go on to accuse Corbyn of telling people how to think! Who is actually guilty of not attacking the Tories enough? One of the most laughable of Mandelson's displays of poor self-awareness is his ludicrous claim that Jeremy Corbyn is risking "civil war" within the Labour Party because he's supposedly giving a higher priority to pursuing his own political agenda than attacking the Tories. It takes a stunning lack of self awareness to publicly attack your own party leader and threaten "civil war" within the party without including a single word of criticism of the Tories while you simultaneously attack your party leader for supposedly being too busy with his own political agenda to oppose the Tories! To put this stunning lack of self-awareness into perspective, the accusation that Corbyn is too transfixed with his own divisive political agenda to attack the Tories is literally the only mention of the Tories in the whole damned Guardian article! Mandelson doesn't mention a single bit of Tory policy that Corbyn should be better opposing. What a weak-minded individual the man must be to not see that his criticisms are far more applicable to his own desperate ranting than they ever have been to Jeremy Corbyn's efforts to lead the Labour Party. I'm pretty sure that most people, even those who don't much like Jeremy Corbyn's politics, would admit that so far he's done a much better job of holding David Cameron and the Tories to account than Ed Miliband ever did. Perhaps Corbyn might do an even better job of holding the Tories to account if he didn't have to worry about fending off a constant bombardment of increasingly desperate and ludicrous public attacks by a bunch of bitter backstabbing Blairites from within his own party? If Peter Mandelson ever had any great thinking powers, he's clearly lost them now. His divisive rant against Jeremy Corbyn can only be seen as damaging to the Labour Party and an embarrassing display of weak thinking skills and poor self-awareness to boot. It's time for tired old Blairites like Mandelson to accept that their time has passed and that the public no longer want their dishonest agenda of hiding right-wing economic policy behind a thin veneer of pseudo-socialist slop. It's time for them to accept that times have changed, and that they either need to move on too and embrace the present, or do everyone a favour and keep their ridiculous fantasies of inciting a "civil war" between the Blairites and the Labour Party progressives to themselves. When I first started writing about the subject of Basic Income in 2013 the topic was very niche. Since then the Basic Income movement has picked up some significant momentum. In this article I'm going to provide a few useful resources and then detail some of the most important recent Basic Income developments. Basic Income is the idea that absolute poverty can be alleviated by providing every member of a society with an unconditional subsistence income. Beside the reduction in absolute poverty one of the main benefits of such a system is that anyone who chooses to work is always better off because their work related income is not subtracted from their welfare payments creating extraordinarily high rates of marginal taxation for the low paid as is currently the current welfare policy in the UK. My first article on Basic Income was this introduction to the subject. I have also written this one about the labour market consequences of Basic Income provision, and this one comparing Basic Income with the current UK social security system. If you want to keep up with the latest Basic Income news then it's worth following Basic Income Europe (Facebook/Twitter) and checking out the Basic Income Earth Network website. You may have heard talk that Finland is going to introduce a Basic Income payment of 800€ for all citizens, but this story has been severely over-exaggerated by elements of the UK press. What is actually happening is the establishment of Basic Income trials in Finland as a result of the Finnish government's adoption of evidence based policy (something else I've been advocating for many years). Essentially the Finnish government is planning to conduct a large scale Basic Income cost-benefit analysis. You can read more about the developments in Finland here. Another major development is the announcement of a kind of Basic Income trial in the Dutch city of Utrecht. What is being done there is not a full-scale Basic Income trial because the payments will only be made to the unemployed, however it will be useful in determining if unemployed people are more likely to go out and find work if they get to keep everything they earn rather than having the majority of their earnings subtracted from their benefits as is the case under . Here's a recent article on the Utrecht experiment. The Political party Podemos was only founded in March 2014, yet after the Spanish General Election in December 2015 it is now the third biggest party in the Spanish parliament, provides the mayors of Madrid and Barcelona and has a social media following twice as big as all of the other parties in Spain combined! Podemos support the concept of Basic Income, and if their exponential rise in popularity and influence continues, it seems only a matter of time before they enter government, meaning Basic Income would well and truly be on the agenda in Spanish politics. 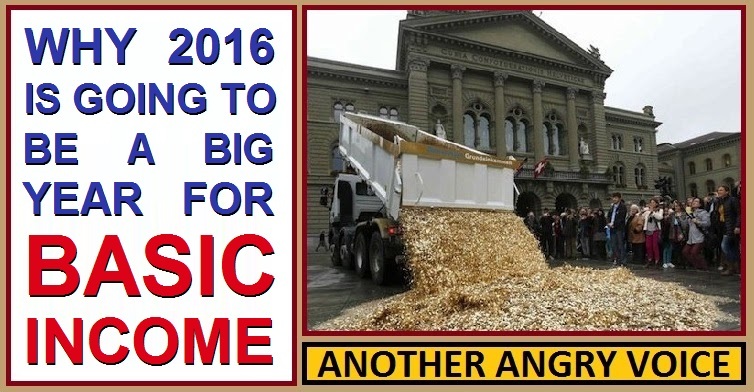 The long awaited Swiss referendum on the introduction of a Basic Income payment for all Swiss citizens is due in the autumn of 2016. The Swiss political establishment are clearly terrified by the concept (voting 146 to 14 against the idea). Right-wing politicians queued up to spew furious fearmongering rhetoric against Basic Income, describing it as "the most dangerous and harmful initiative ever", "a bomb at the heart of our society and our economy" and a "hand grenade that threatens to tear the whole system apart". Despite the Swiss political establishment's campaign of fearmongering against the idea of eliminating absolute poverty through the introduction of a Basic Income scheme, opinion polls show that public opinion is still quite evenly divided on the subject. The Liberal Party won an astonishing election victory, recovering from their worst performance ever in 2011 to win an absolute majority on an anti-austerity platform in 2015. One of the many progressive pre-election policy resolutions is the implementation of a Basic Income scheme for all Canadians. In December 2015 Kingston, Ontario became the first municipality to endorse Basic Income and call on the federal government to develop the measure at the national level. It's unlikely that such a bold progressive proposal would be implemented at the national level without a huge amount of pressure on the Liberal Party leadership, however the fact that Basic Income is on the agenda at all in Canada is definitely a noteworthy development. Considering developments in other countries, the subject of Basic Income is still somewhat in the shadows in the UK. The Green Party are still the only significant UK party to put Basic Income as one of their headline policy proposals. There are Basic Income advocates within the SNP and the Liberal Democrats, but Basic Income was not mentioned in either of their 2015 manifestos. The Labour Party don't advocate Basic Income either, but the new leader Jeremy Corbyn has appointed the Basic Income advocate Richard Murphy as one of his economic advisers. While the subject of Basic Income seems to have gained little traction within the UK political establishment, it is gaining more recognition elsewhere. Even though several of the recent articles about Basic Income trials in the UK press have been somewhat inaccurate in their claims, it's still notable that the subject is being written about in most of the mainstream newspapers. It's also worth noting that the RSA have started advocating for Basic Income, as have the innovation charity Nesta. Basic Income looks set to become one of the big political topics of 2016. If the trials in Finland and the Netherlands are as successful as previous Basic Income trials in demonstrating reductions in poverty, increased entrepreneurship, increased worker productivity, reduced domestic violence etc ... then advocates of Basic Income will have even more hard evidence to argue their case. The Swiss Basic Income referendum towards the end of 2016 is likely to attract a significant amount of press coverage, especially if the Swiss political establishment continue trying to polarise the debate with their policy of transparently alarmist fearmongering. Whether the Swiss referendum on Basic Income is successful or not, public awareness of the concept is set to increase dramatically over the coming year. In my view it's only a matter of time before Basic Income schemes become commonplace. When people look back they'll recognise 2015-16 as the period when the Basic Income movement really began to gain traction. Is the Atos administered WCA regime psychological torture for the disabled? On the 20th of December 2015 Spain experienced a democratic political revolution. The two party duopoly on political power was consigned to history as millions of Spaniards voted for alternative political parties. In this article I'm going to run through some of the important issues. Two political parties have held a duopoly on political power in Spain ever since the Franco dictatorship came to an end in the 1970s. PP share the same fanatically right-wing economic stance as the Tories in the UK however they're significantly more right-wing in terms of social policy (during the last parliament they attempted to make abortion illegal and introduced 30,000€ fines for participating in "unauthorised" political protests). The PSOE are very much like the UK Labour Party during the New Labour era. They masquerade as socialists but actually promote orthodox right-wing economics behind a thin veneer of pseudo-socialist slop. The 2015 general election saw the share of the vote taken by these two parties reduced to just 51% between them. PP took 29% of the vote which was their worst performance since 1989 and PSOE took 22% which was the worst performance in their entire history. Anyone who thinks the two big establishment parties might bounce back to regain their former dominance should consider the voter demographics. The new left-wing anti-corruption party Podemos came third overall but they were the most popular party of all amongst under 35s. The new centre-right party Ciudadanos was the most popular with 35-44 year olds. The older generations were the only ones to stay fiercely loyal to PP and to a lesser extent PSOE. The ruling PP used similar tactics to the Tories in the UK. They loaded the burden of austerity onto young people (who suffered 50%+ unemployment for the majority of PP's time in government) and workers (who had their wages and labour rights significantly eroded) while bribing the older generations with pension increases. The ploy worked in that it secured the votes of the elderly, but attacking the younger generations so mercilessly is clearly political suicide from a long-term strategic perspective. Under the punishing ideological austerity of the PP government unemployment in Spain has remained ludicrously high. General unemployment is still 21.6% and youth unemployment has remained around 50% for years. The result of this is hundreds of thousands of predominantly young Spanish workers leaving Spain to find work elsewhere in the EU. The electoral impact of such heavy outward immigration is difficult to estimate, but it's impossible to say that it hasn't had an influence on the outcome. On the one hand the economic exile of so many younger voters will have benefited the two establishment parties favoured by older voters, but on the other hand if economic conditions weren't so incredibly dire as to drive hundreds of thousands of voters out of the country, it's likely a significantly smaller percentage of the electorate would have decided to vote for new alternative parties like Podemos and Ciudadanos. The suspicion of many in Spain was that the new centre-right political party Ciudadanos were going to enable PP back into power despite their pre-election promises that they wouldn't. As the results came in it became clear that a PP-Ciudadanos alliance would have nowhere near enough seats to form a majority government. This means that the only conceivable way for PP to hold onto power would be to form an alliance with their traditional rivals for absolute power PSOE (I'll explain why this is unlikely under the PSOE subheading). PP are still the biggest party so they could attempt to form a minority government, but the consequences of a right-wing party attempting to hold onto power in such a manner have only just been played out in Portugal. The Portuguese right-wing minority government was widely regarded as an anti-democratic power-grab and lasted only a matter of weeks before they were replaced by a left-wing coalition with a clear majority of seats between them. The party that finished third was only founded in March 2014. They finished just shy of PSOE with 20.7% of the vote (to PSOE's 22.0%). Due to the disproportional nature of the Spanish electoral system this translated to a much lower 69 seats to PSOE's 90, but despite this, their performance can only be seen as a continuation of their remarkably successful growth. They have not only established themselves as a significant parliamentary force, they also have the mayors of Madrid and Barcelona and secured very strong backing in Catalonia and the Basque Country. Podemos were the most popular party of all in two of the four Catalan regions (Barcelona and Tarragona) and were the most popular national party in both of the others (Girona and Lleida). Podemos were the most popular party in two of the three Basque regions (Álava and Gipuzkoa) and only finished narrowly behind the Basque Nationalist party in the other (Biscay). Aside from these clear successes Podemos also finished as the second most popular party in nine other regions (A Coruña, Alicante, Balearic Islands, Castellón, Las Palmas, Madrid, Navarre, Pontevedra and Valencia). Podemos were not the only new political party to do well. The centre-right party Ciudadanos finished in fourth place with 13.9% of the vote and 40 seats. Ciudadanos undoubtedly did well, but they fell short of their objective of winning enough seats to hand power back to PP. It doesn't matter that Ciudadanos repeatedly promised not to enable PP and Mariano Rajoy back into power, it was always clear that that was their objective. Many people saw their rise in popularity as an attempt by the Spanish establishment to back a Trojan horse political party to soak up the protest votes and derail the exponential rise of Podemos. The suspicions that Ciudadanos are just an establishment Trojan horse were confirmed in the days after the election when their leader Albert Rivera called for the two establishment parties to join Ciudadanos in a grand coalition in order to lock Podemos out of power. To go from posing as an anti-establishment party and promising not to keep PP in power to actively promoting a PP led establishment coalition in the space of a few days either side of the election show Ciudadanos up for the cynic political opportunists that they are (and always seemed to be to anyone with a grain of political sense). 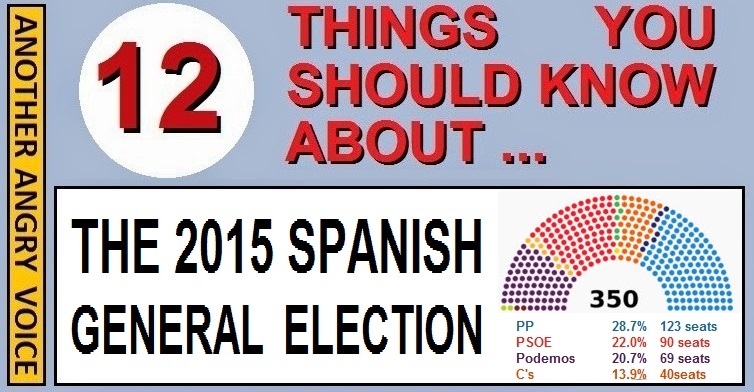 The supposedly socialist party PSOE suffered the worst result in their entire history winning just 22% of the vote. This leaves them in an extraordinarily tricky position. It's hard to envisage a course of action that will not end up damaging their party even further. The most damaging course of action of all would obviously be for them to enable their historical rivals PP back into power by joining a grand coalition. We only need to look at what happened to PASOK in Greece after they enabled the right-wing pro-austerity New Democracy party into power in 2012. The move was so unpopular with their own supporters that they ended up slumping to just 4.7% of the vote in 2015 reducing them to the 7th party in Greece, a spectacular fall from grace for a party that had formed a majority government in 2009 with 43.9% of the vote. Another option for PSOE is to form a left-wing coalition, but this is dangerous territory for them too. If the left-wing coalition goes well then it's likely that the newcomers Podemos will take most of the credit at the next election, but if it goes badly PSOE will end up losing votes over it. A weak left-wing coalition looks like a lose-lose situation for PSOE. Another option is for them to refuse to join in with any coalition leaving PP to attempt to form an incredibly weak minority government that would be bound to fall triggering new elections. This is also a risky strategy because everyone knows that they only finished ahead of Podemos by the slimmest of margins, so their propaganda line from the 2015 election that they are "the only party that can stand up to PP" has been rendered completely ineffective. It's clear to everyone who opposes PP that Podemos are in the ascendency and PSOE are in rapid decline. There are a number of obvious parallels between the 2015 general elections in Spain and Portugal. Both saw the ruling right-wing party lose their majority, both saw the head of state (the right-wing Portuguese President and the King of Spain) hoping to enable the right-wing party back into power, both elections saw a huge rise in support for left-wing anti-austerity parties. The Portuguese President encouraged his right-wing party colleagues to squat in power with a weak minority government, but they were soon defeated and replaced with a left-wing coalition of the nominally left-wing main opposition party and two genuinely left-wing parties. It remains to be seen whether the King of Spain will encourage Mariano Rajoy and PP to squat in power with a weak minority government, or whether the Spanish establishment have learned their lesson from what happened to their Iberian neighbours just a few months previously. The Spanish electoral system is a lot fairer than the staggeringly disproportional and unrepresentative system in the UK, but it's still heavily skewed in favour of the two main parties and badly in need of reform. The major problem with the Spanish system is the wild variance in size between highly populated metropolitan constituencies and much more sparsely populated rural constituencies. The result of these disparities in constituency sizes is a huge bias in favour of the ruling PP. The number of votes cast for PP per representative in the Spanish parliament was 58,664. The number of votes per PSOE representative was 61,453 but the number of votes cast per Podemos representative was 75,209. One of Podemos' key non-negotiable demands is reform of this unfair electoral system, so if they do end up sharing power as part of a coalition government (or winning outright in a repeat election) we should expect Spain to adopt a much fairer voting system. Podemos have by far the biggest social media presence of any of the Spanish political parties. In fact their 1.043 million Facebook followers absolutely dwarfs the 469,000 followers of the other three major national parties combined (PP 124,000, PSOE, 113,000, C's 232,000). It's interesting to note the significant reverse correlation between social media presence and electoral spending. Podemos spent only 0.48€ per vote cast in their favour. Ciudadanos spent 1.26€ per vote, PSOE spent 1.63€ per vote and PP spent 2.00€ per vote. To me it's not actually that surprising that Podemos ended up spending less than a quarter of the money per vote than PP did, because a well orchestrated social media campaign is the best free advertising possible. 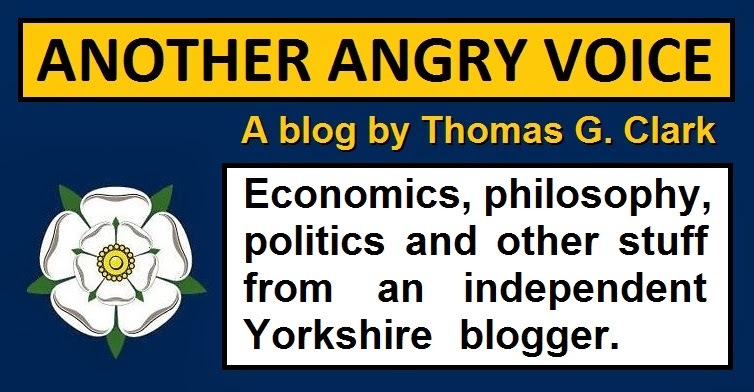 If some bloke from Yorkshire who has never appeared on the TV or even in his local newspaper (me) can reach millions of people per week with his social media content with 220,000 followers, then a well staffed and well funded political party with over a million Facebook followers should be able to reach staggering numbers of people, especially during an election campaign. A lot of people still sneer at social media as if it's some kind of meaningless distraction when it comes to serious politics, but the result of the Spanish election makes it absolutely clear that social media presence is an increasingly vital component of electoral success, (especially for alternative parties that suffer relentless negative coverage in the pro-establishment mainstream press). It seems increasingly likely there will be a replay of the Spanish general election in 2016. A grand coalition including both PP and PSOE is the only conceivable way that a coalition government with a strong majority could be formed, and it's clear that a move by PSOE to prop up their traditional rivals and enable Mariano Rajoy back into power would destroy the credibility of their party. Either no government will be formed meaning that new elections will be automatically triggered within two months, or a weak government will be formed but will be thrown into crisis at the first major disagreement between the rival coalition parties. Unless PSOE decide to commit electoral suicide, another set of elections sooner rather than later looks almost inevitable. What does this all mean for the EU? The rise of Podemos must strike fear into the hearts of the pro-austerity technocrats who run the EU because were Spain to reject ideological austerity then it would be a much bigger problem for them than Greece. We all know that the Troika of the EU, European Central Bank and IMF managed to back the left-wing anti-austerity Greek government into a corner and humiliate them by forcing them to carry out an extreme-right programme of socially destructive austerity and ideologically driven privatisations. However Greece is just a small country that generates just 1.3% of economic activity in the EU. For the unelected technocrats who run the EU it's not a problem to vandalise the Greek economy for "the greater good" of protecting the interests of German and French banks. However Spain is a much bigger economy, the fifth biggest in the EU and the fourth biggest in the Eurozone. Spain's economy generates 7.6% of economic activity in the EU making it a much bigger problem if their elected government were to reject right-wing ideological austerity. The EU, ECB and IMF Troika spent the first part of 2015 grinding Greece into submission, ignoring the will of their electorate and humiliating their democratically elected government. If Spain ends up with an anti-austerity government it's going to represent a much bigger problem for the unelected pro-austerity technocrats. Such an occurrance would mean that Spain, Portugal and Greece would all have anti-austerity governments. The economic repercussions of the Troika campaign of economic destruction in Greece (1.3% of the EU economy) were severe enough, but launching similar concurrent campaigns against Spain (7.6%) and Portugal (1.3%) would mean that the EU would be at economic war with over 10% of its own economy (13% of its own population)! The issue for Spain is whether they have the confidence to stand up and reject austerity, or whether they're so afraid of the humiliation and economic destruction unleashed on Greece that they'd overlook the fact that Spain is a much more powerful economy. If Spain have the confidence to try it they could lead the fightback against the EU's socially and economically destructive campaign of ideological austerity, especially if they ally themselves with Greece and Portugal. Will Labour learn anything from the annihilation of PASOK in Greece? Donald Trump is clearly a highly unstable individual who terrifies anybody with the few braincells necessary to spot a power-crazed wannabe fascist demagogue. His outrageously ill-conceived proposals to ban all Muslims from entering the US are about as fascist as it's possible to be. Just imagine if such a threat was made against Jews by a leading political candidate! The factor that makes Donald Trump such a threat to civilisation isn't that he's a crackpot with a tendency for blurting out fascist policies then refusing to back down because his ego can't tolerate him ever admitting that he was wrong. 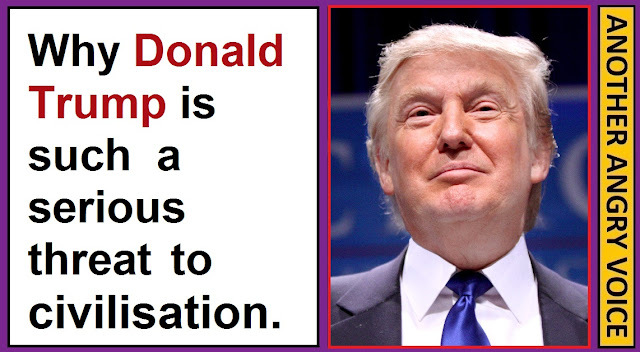 The factor that makes Donald Trump such a threat to civilisation is the self-interest of the Republican Party. Trump's proposals to impose religious tests on immigrants and to ban Muslim American citizens from returning to the US are so extreme and so unconstitutional that he should obviously be thrown out of the Republican Party. He's even refusing to make exemptions to his ban on Muslims entering the US for US Muslim soldiers and intelligence officers who have been risking their lives serving overseas! How anyone in the Republican Party can accept such extremist nonsense is pretty baffling on the face of it. The problem for Republicans is that they know that if they do throw Donald Trump out of the party he's going to stand as an independent presidential candidate and split the right-wing vote, which would almost certainly mean a huge win for whoever the Democrats put forward. Even if Trump isn't thrown out of the party now, he's far too egotistical to go quietly if he doesn't win the nomination. If the less extremist Republicans all band together to support a candidate who doesn't promote outright fascism, then Trump is still likely to strop off in a huff, stand as an independent and split the Republican vote anyway. This means that the debate for Republicans is about which is is the worst scenario. Donald Trump using their party to usher in the era of overt American fascism, or an easy win for the Democrats. Judging by the fact that Trump hasn't been expelled from the Republican Party for his extremist ranting suggests that Republicans actually prefer the idea of their party being used as a vehicle for the promotion of outright fascism than the idea of a win for whoever the Democratic select as their candidate! We all know that right-wing politics is all about the promotion of self-interest above community interests, after all there was "no such thing as society" according to Margaret Thatcher as she wreaked industrial destruction, mass unemployment and life destroying poverty on communities right across the UK in the 1980s. The problem is that the price of Republicans putting their own self-interest first at this juncture is allowing the rise of a wannabe fascist demagogue, and the ushering in of the era of overt American fascism. It seems that Republicans would actually rather that happen than lose their third consecutive election to the Democrats though! 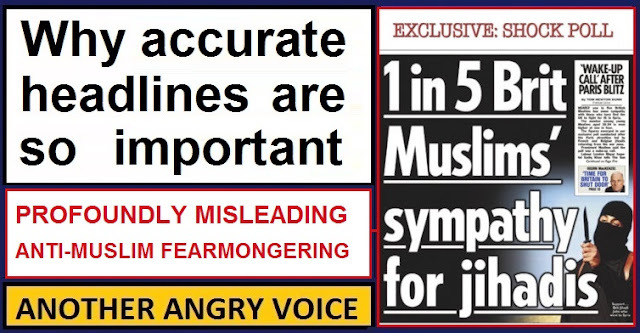 The cowardly and staggeringly impractical petition to "Close the UK borders until ISIS is defeated"
On November 23rd 2015 the S*n lead with the appallingly misleading headline "1 in 5 Brit Muslims' sympathy for jihadis" when the actual question they based this shock headline on made no mention of jihadis or Islamist fanatics of any description. What it actually asked was whether respondents had sympathy towards anyone going to fight in Syria (which includes ISIS, but also the anti-Assad Syrian Free Army and the anti-ISIS Kurdish led Syrian Democratic Forces). What is more, the poll also revealed that 1 in 7 of the general UK population expressed similar general sympathies towards people going to fight in Syria, meaning that there is actually very little difference between the opinions of British Muslims and those of the general British public. A more accurate headline might have read "According to a poll based on the very dubious methodology of trawling the Survation database for Muslim sounding names it turns out that British Muslims are very marginally more likely to express sympathy for people going to fight for or against ISIS in the Syrian civil war than the general British public are" but then that surely wouldn't have sold as many papers as the blatantly misleading headline they ran with. Aside from stripping out the desired anti-Muslim fearmongering the Murdoch empire deem necessary in the wake of the Paris atrocities, such an accurate headline would be unthinkable because it's obviously far too long to scan. As an independent Blogger one of the most difficult things is coming up with short snappy article titles that will accurately describe the contents and incentivise people to actually click on the link. I'll freely admit that tabloid news teams are much better at coming up with snappy and/or humourous titles than I am. Probably the best ones I ever came up with was "Tories sell NHS blood supply to vampire capitalists" back in 2013 and the incredibly clickbaity "Don't Read This Article" earlier in 2015. After addressing the appallingly misleading nature of the S*n headline with an infographic, later that day I posted an article about the DCM Cinema group refusing to allow the screening of the Church of England's Lord's Prayer advert. This article provoked quite an uproar with one of the main recurring complaints being that it was unacceptably misleading to use the word "banned" to describe the decision to not allow the advert to be shown. Numerous people complained that my use of the word "banned" was inaccurate/misleading, and others became so upset that they claimed they'd lost all respect for me, and that the credibility of the rest of my work had been destroyed. In my view these kinds of statements were huge over-reactions, especially from people who were trying to take the rational high ground. However people are entitled to their views, even if their main complaint of inaccuracy relies on some kind of semantic point about how "banned" is a totally unacceptable word to describe "the prevention of something being shown". To give an example of why I consider the word banned to be appropriate here's a question: If I write a set of rules saying "no Christmas music is allowed in my house" (then justify the house rules by releasing a statement about how it's not to be allowed because some people might find it offensive), have I "banned" Christmas music from my house or not? Apparently some people would argue that I haven't, and furthermore that anyone saying that I had would be guilty of respect-destroying levels of inaccuracy! I did try to consider what the objection was, and whether there was something more to it than some kind of semantic point about "banned" being an outrage-inducingly inappropriate synonym for "prevented", "prohibited", "forbidden", "stopped", or whatever other word people would have preferred me to use, but I still can't see how my use of the word "banned" provoked such a furious response. The reason I found this fixation on the word "banned" so disappointing is that surely people can come up with stronger criticisms of my article, or defences of the ban on religious adverts than what appears to be nothing more than a semantic point about the use of a single word? Having looked at the headline again for some time (to try to figure out why it made so many people so angry), I have spotted something that I could have changed to make it more accurate, but it's not actually my use of the word banned at all, it's the context in which it's used. What I wrote was "The Church of England advert that has been banned ..." when a more accurate interpretation of events might have been to write "The Church of England advert that is banned ..." . The difference being that it is possible to read "has been banned" as an implication that the decision by DCM to ban the religious advert in their cinemas has only just been taken, while the use of "is banned" more accurately describes the actual situation where the advert was not allowed to be aired in UK cinemas due to pre-existing rules, but that these rules were then justified with a statement about how adverts from religious groups are not allowed in DCM cinemas in case certain cinema goers get offended by them. This "people might get offended" justification was the actual crux of the article but it received so much less attention than my use of the word banned in the headline. Headlines are particularly important because so many people read no further than the headline. The circulation of The S*n has now dipped below two million, but millions more people will have seen that misleading front page headline on news stands, in canteens, on public transport, in waiting rooms or in family homes. In my view it's doubtful whether more than 20% of the people who saw the misleading headline actually read the whole article, and it's doubtful whether 0.2% of the people who read the headline ended up looking up the Survation poll that the misleading headline was supposedly based on and checking the wording of the actual question for themselves. Similarly with my blog post about the Church of England advert, my Facebook statistics tell me that my post (including the headline image and link to the article) was seen over 288,000 times in Facebook news feeds, and my blog statistics tell me that only* 27,000 odd people actually clicked the link to see what the article actually said. Most of the people who see any of my articles will not click on them, which is fair enough. I certainly don't click on all of the articles I see going across my Facebook news feed either. I know from my statistics that if I get my headline wrong, it doesn't matter how good the article is, people won't click on it and it will only get read by a tiny percentage of people who see it (sometimes below 1%). If I get it right then it will get clicked on by a much higher percentage of people, shared, and eventually read by tens, or even hundreds of thousands of people. One of the lessons I've learned from the reaction to my headline is that there is more to writing a good one than quickly typing some text into a box because you're in a hurry to get your article published. Another is that it's important to state things in ways they can't be misconstrued (deliberately or otherwise) because if I word my headline wrong it's clearly possible that comments from people addressing the actual contents of the article will be completely drowned out under a tide of complaints from people who object to the headline. Another thing I've learned is that when people are upset they say utterly bizarre things, like people comparing my use of the word "banned" to describe a situation where something is not allowed to be shown with the appallingly misleading Muslim fearmongering headline in the S*n earlier that day. Apparently some people are prepared to argue that some lone-wolf blogger using the word "banned" instead of "prevented" (or whatever word they would have preferred) in the title of an article read by fewer than 27,000 people is somehow the direct equivalent of the editors of Britain's most widely read newspaper deciding to run a totally misleading headline, seen and believed by countless millions of people, and apparently devised with the objective of stirring up anti-Muslim hatred in the wake of the Paris atrocities (making the S*n editors who gave it the green light guilty of fighting the ISIS propaganda war for them by creating divisions between Muslims and non-Muslims). Of course I'll aspire to be more accurate in the way I phrase things when it comes to thinking up headlines from now on and I thank anyone who pointed out their objections in a polite, reasonable and non-hyperbolic manner for their input. However I'm not taking such a stance because of the flood of extremely negative reactions to the title of my article, I'm doing it despite them. Having so many people say that they've "lost all respect" for me, attacking my credibility, slinging insults at me, misrepresenting what I actually said, completely ignoring the majority of points I raised in the article, and even comparing my work to the anti-Muslim fearmongering of the S*n was a bit of an onslaught, but it definitely won't deter me from writing about what I want to. In fact it actually makes me far more inclined to write something else that these people will dislike just to prove to myself that I won't by silenced from expressing my own opinions, no matter how many people try to shout me down or make insulting comparisons between my work and the appalling anti-Muslim fearmongering of Rupert Murdoch's vast propaganda empire. I'll just have to make more effort to ensure my headlines are not as easily misconstrued so that a higher percentage of any complaints end up addressing the actual content of the article, not the wording of the headline. * = My use of the word "only" to describe 27,000 hits does seem a little churlish for a couple of reasons. 27,000 hit from 288,000 views is a hit rate of almost 10% which is actually pretty good, suggesting that the headline was interesting enough to get a significantly above average number of people to actually click on it. It also seems churlish because I'm pretty sure that there are a lot of independent bloggers out there who would be delighted with 27,000 hits on one of their articles.